Our story began more than in the late 1970’s, when operators still connected calls manually. Today, we have the widest 4G LTE Network in the Marianas and Guam. Ours is a story of technological innovation, exploration and evolution. 1979 – IT&E Corp. is formed by Jose D. Perez, John M. Borlas and the late Jaime F. Tuquero, selling business telecommunication products and equipment. 1983 – Guam is connected to the rest of the world with long distance telecommunication services introduced by IT&E Overseas. 1994 – The world wide web comes to Guam with the launch of Talaya Internet, which introduces internet access, email, broadband and other related services. 2000 – Communications improve with the launch of PCS Wireless services and the new earth station satellite, which enable more worldwide transmissions to route through IT&E. 2008 – A new chapter of innovation and technological advancement begin. PTI Pacific purchases IT&E and invests $10 million for network upgrades. 2009 – Guam and the CNMI become even more interconnected when IT&E and GTE are combined under the IT&E name. Advancements continue with the launch of our GSM network. 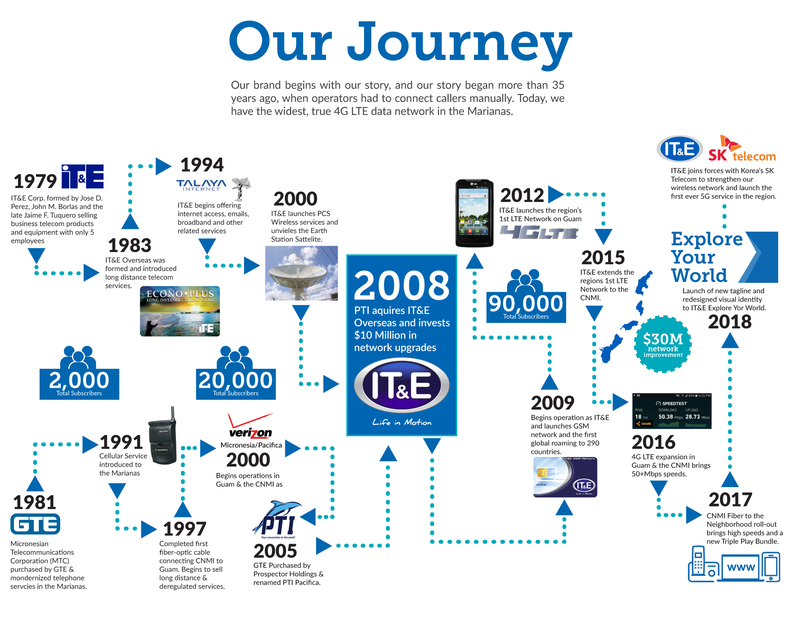 2012 – IT&E launches the regions first LTE network on Guam, with speeds on par with the rest of the world. 2015 – The LTE network is extended to the CNMI. 2016 – Residents experience increased speeds of up to 50+ Mbps with 4G LTE expansion in the Guam and the CNMI. 2018 and beyond – Expansion continues, with more innovation and upgrades to come.